These are truly all ingredients I have in my pantry/freezer at all times. This is a comforting and easy meal to throw together. I always keep frozen vegetables in my freezer—they are so easy to add to any meal, especially if you are running low on produce for the week! Don’t forget to reserve the pasta cooking water, a mistake I make far more often than I’d like to admit. Paleo: Use zucchini noodles instead of spaghetti. Omit Parmesan cheese. Bring a large pot of salted water to boil. Add the spaghetti and cook to al dente, according to package instructions. Drain the pasta, reserving 2 cups of the pasta water. 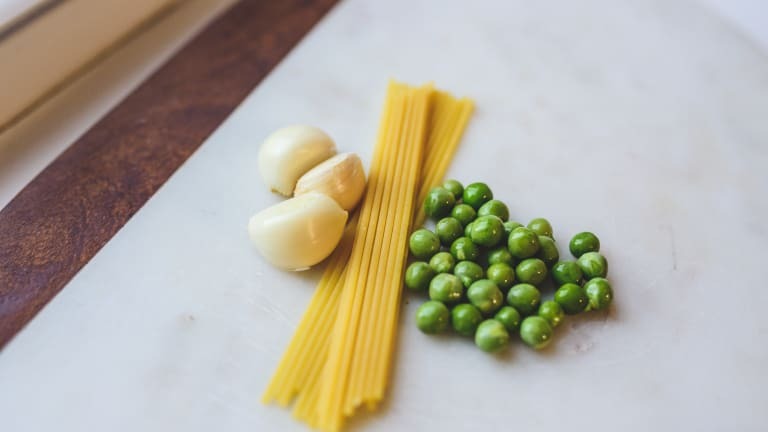 Once the pasta is cooking, heat the olive oil in a large nonstick skillet or wok over medium heat. Add the onion, garlic, carrots, salt, and pepper. Cook until onions and carrots are tender, about 8-10 minutes. Add the tomato paste and ½ cup hot pasta water and stir to make a sauce. Add the oregano, thyme, and peas and stir. Mix in the spaghetti and Parmesan cheese with tongs or a pasta spoon, adding more reserved pasta water if needed to coat the pasta. Serve immediately, with more cheese on top, if desired.